It is certainly good news that awareness of environmental concerns has been growing, and steps are being taken to allow this great sport to continue for many decades. 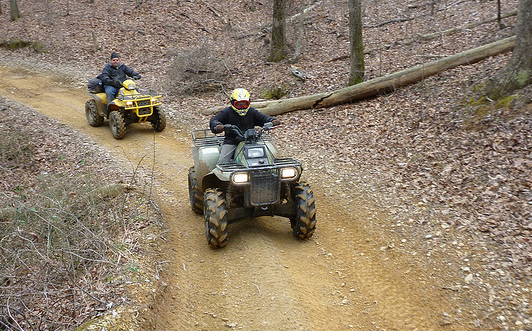 To continue to enjoy ATV riding it is important that good relations between riders and the general public continue and increase. Most the time common sense and consideration of others is all that it takes for this to happen. Here are some things to consider when you are out riding. Learn about the area you will be riding in. Get good maps of the area and talk to the land manager or the land owner to learn about any restrictions or rules. Be sure and stay on designated trails and follow ay speed limits and posted signs. Always leave gates and fences the way that you found them. If you have to open a gate, be sure you once again close it securely after passing through. There is a reason the gate or fence is closed, and not closing these will taint the land manager or owners perception of ATV riders. Take your trash with you. Take a trash bag with you to place trash in until you get to a trash recepticle and can dispose of it properly. As a rule we try and leave an area better than we found it. If you do come to some trash, pick it up. If there are branches or trees blocking the trail, if possible pick them up and get them off the trails. Leaving an area better, will ensure that we are welcomed back in the future. Give the right away to pedestrians,horseback riders or bikers. If you come upon others be courteous and give them the right away. Go slow and give them plenty of room to pass.